Adagio Mills is the dream of Andrew and Nadine Hulme that has become a reality. It has been a huge journey so far and we still have a very long road ahead of us! Follow our story on facebook or though our email newsletter. We believe strongly that Australian manufacturing can be sustainable. 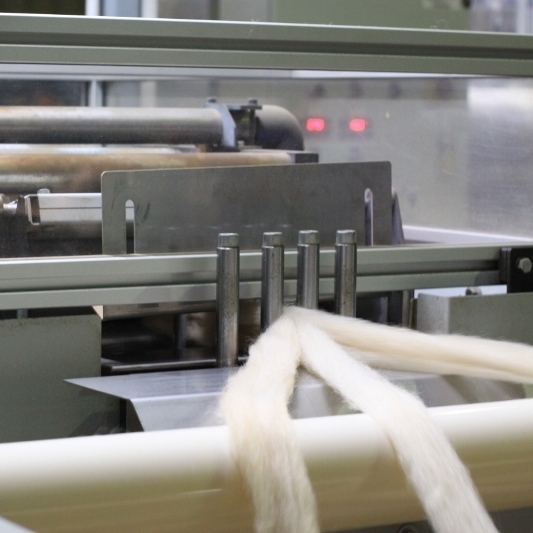 Adagio Mills will be creating knitting yarn, rovings and other products from Australian grown fibres. All our yarns are proudly 100% made in Orange. Support Australian manufacturing and farming by spreading the word! We often get asked why we started Adagio Mills. Andrew and I are both engineers and in 2007, we moved to Orange from Sydney for work with a plan to stay for 2 years. We loved it so much we are still here! After a few years we bought a 9 acre property to follow our dream to grow as much of our food as possible and share it with our visiting family and friends. As part of this process we decided to initially stock alpacas (we now have some steers and sheep as well). The primary reason for this was our paddocks can get quite boggy so their padded foot was suitable for our ground and they are very easy care for people like us who are very new to farming. The breeder we were talking to also said the magic words... "you can spin and knit with the fleece". That drew my love for handcrafts into the decision! So we took our 3 pregnant female alpacas home. We loved every minute of having them on the property. I soon realised that I don't have the patience for handspinning (and hence I have great respect for those that do!) so we found that we could send our fleece away to be spun. We LOVED the results. There is something really special about seeing my children in clothing knitted by me and made from yarn grown on our property. However we couldn't quite let go of the engineers in us, this whole process started us asking questions. The questions started with "Why was there no one in NSW at the time offering this service? ", "What do people do with their fleece currently?" and just kept coming! As we found answers, we found more questions, which led to more answers and more questions until we found ourselves writing a business plan. As engineers with a love for alpacas, fibres and crafts it made us uniquely placed to start such a project. It wasn't a quick process, it took us a few years to source the right equipment, prepare the business plan, longer than we expected to obtain finance then about a year for our milling equipment to be manufactured. We found out that our funding was approved the week before our Xavier was born! There were a number of necessary items that we were unable to obtain bank funding for so we did a kickstarter campaign. This was wonderful, challenging, inspiring, hard, frustrating, uplifting and rewarding all rolled into one. It really started a conversation about Adagio Mills and we gained 200 wonderful backers who were our very first customers. It made a huge difference for our business initially financially, enabling us to set up our water recycling system, but then later in the year these backers became our very first customers and it was wonderful to have a set of understanding people to have our very first yarns. The milling equipment finally arrived in May of 2015. This was such an exciting moment, when those trucks rolled up, unloaded and we took the crowbar to open the first box. This was the moment it all became very real. We officially commissioned the mill with the manufacturer's chief engineer in June 2015 and off we went. There were challenges aplenty. Starting a mill in Orange in the middle of winter with daily maximum temperatures below 5 degrees Celcius was in hindsight not the best plan. But that was when the equipment arrived and meant that we had to learn everything the hard way. Many of our machines are prototypes specifically designed for us so there wasn't an operating manual in sight! From commissioning we started processing fleece for our kickstarter backers and our very first prebooked processing customers. Most of our business is processing for other Australian farmers and we love sharing their excitement at seeing their fleece being made into yarns. The Adagio family has been growing, Steve our production manager, who brings >30 years experience from the printing industry, joined us from day one when the machines arrived and we are currently employing 4 people. Watching our little team grow and develop their skills has been so wonderful. As Adagio Mills makes it through these rocky start-up phases we will be employing more people, we really need about 8-10 people however we have to keep reminding ourselves "baby steps"! Providing local employment that is flexible is one of our goals for this business. Our people are so important, we are building Adagio Mills together. We made our first commercially available Adagio Mills yarn in December 2015. I feel like our journey is still beginning, we are very happy with the yarns we are making but we are continually learning how to do it better, how to improve our process or indeed how to process other fibres. We are currently working through test spins of suri alpaca, sheep wool and mohair. So keep an eye on us here and on social media to share the continuation of this crazy story. Visitors welcome to view display yarns. Mill tours by appointment only. Fleece for processing can be posted or dropped off during business hours. Please contact us for more information. Adagio Mills is a semi-worsted mill as we have a carding and a drafting stage before we spin the yarn. The following is some information about our process and it is all completed in our factory space in Orange NSW. The fleece goes through many stages to be processed into yarn and is very labour intensive. To process the fleece into yarn, it is scoured, picked, dehaired (optional), carded, pindrafted, cone wound, ball wound, steamed and packaged.